Cybersecurity legend John McAfee predicted that bitcoin would reach a value of $1m by 2020 (and that he’ll eat his own winkle if he’s wrong). And discussions about the future of this mother coin are really heating up as analysts, investors and crypto enthusiasts are starting to pick sides. So whether you choose to dabble in the crypto market, ignoring those red-faced critics declaring it "just another Tulipmania", or opt to watch the show unfold from a safe distance, you still need to keep your finger on the crypto-market pulse. Because you might be witnessing the advent of the future of money. 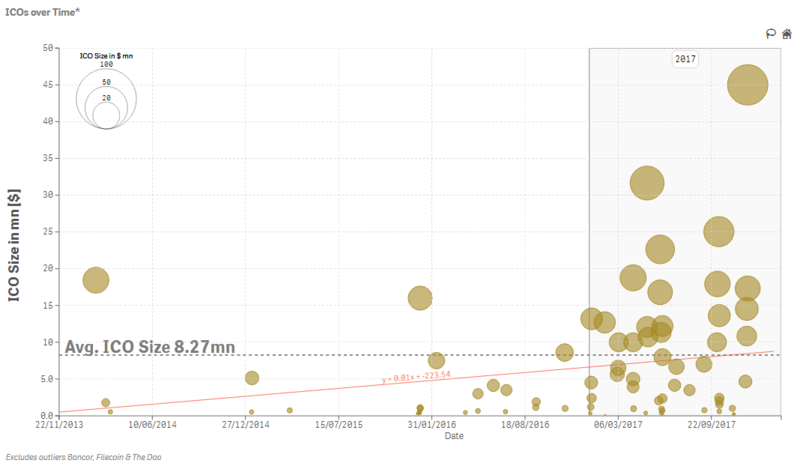 Here’s a fascinating review of the significant crypto milestones in easy-to-digest Vizlib charts. What are cryptocurrencies and why are they so hot? Browse any news site’s investment section, and you’ll find article after article exploring the phenomenal boom of digital money, otherwise known as cryptocurrencies. But what are they exactly? A cryptocurrency is a digital currency created and held electronically. As of January 2018, there are more than 1300 cryptocurrencies available online, and the number continues to grow daily. The first and most popular cryptocurrency is bitcoin. No one controls bitcoin. 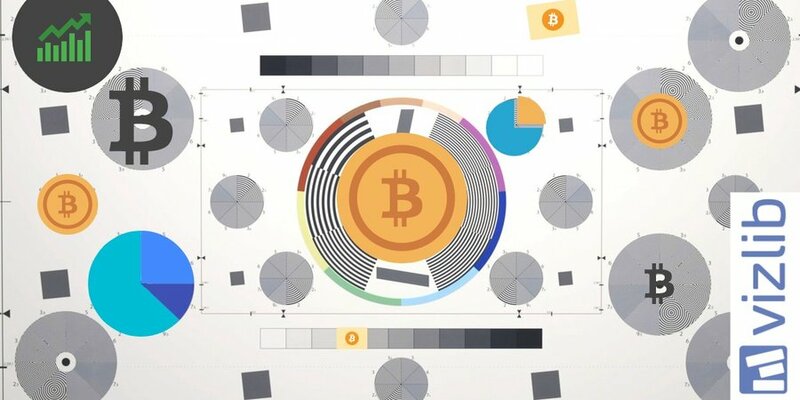 It is the first digital currency that is completely decentralised, meaning it’s independent of any central authority. Unlike Euro, Dollar or Pound, Bitcoin is not printed. It exists exclusively online. Bitcoins are created, or "mined", using computer software that solves mathematical problems. Anyone with access to a powerful computing machine can join the community of miners. Bitcoin and other cryptocurrencies are an attractive alternative to standard money thanks to some of their inherent characteristics, such as the lack of government control, anonymity, speed and cost-effectiveness of digital transactions (especially international ones) and transparency. Many believe that cryptocurrencies are the future of money, as the world’s move to a cashless society accelerates. 2017 has seen a huge shift from getting familiar with cryptocurrencies to pouring real money into the emerging market. Bitcoin and other leading crypto coins saw their valuations grow consistently and reach all-time highs at the end of the year, with cap figures pushing over 4000%. 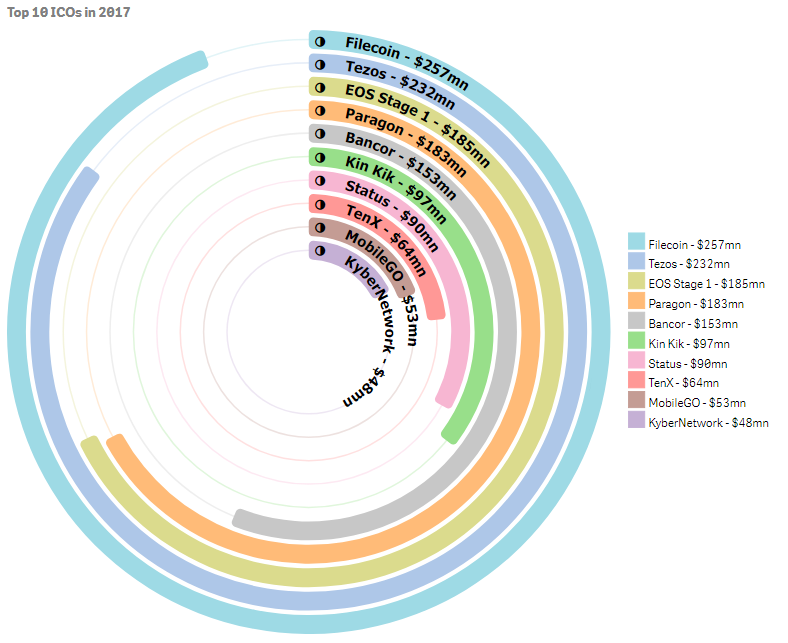 We’ve put together a few neat charts to recap on the major crypto milestones of 2017. We can confidently say that 2017 was a year of bitcoin, but analysts prophesize that 2018 will be all about ether. Let’s have a quick look at some of the game-changing events that happened this year. In one year, bitcoin’s price has gone from $973 on January 1, 2017, to $14,129 on New Year’s Eve. That’s a 13-fold increase in value for a cryptocurrency that’s been declared "dead" more than a hundred times since its inception in 2009. 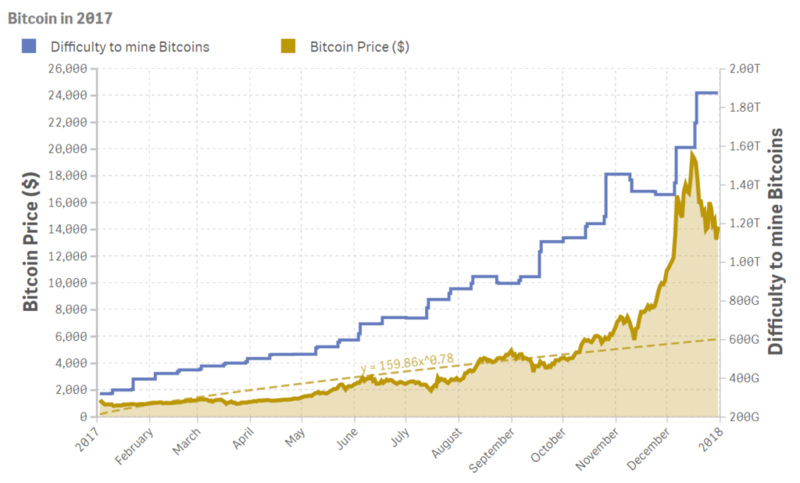 Bitcoin’s value is extremely volatile. The fact that its price is set by the market makes things even more complex. There are various factors at play in determining Bitcoin’s value, including liquidity, government regulations, bad press (remember the Silk Road story? ), coin dumping by large traders, new, prominent investors joining the party, and more. Although scores of high-calibre VCs and investment funds have started actively investing in bitcoin and other digital currencies, it is still seen as a high-risk asset that should be considered with caution. According to new statistics, the process of bitcoin mining uses more electricity in a year than the whole of Ireland. As the volume of bitcoin transaction picks up, the network is sucking up more and more electricity. Dutch bank ING revealed that electricity for a single bitcoin transaction could power a home for almost a whole month. Unsurprisingly, the bulk of bitcoin mining is done in China, where energy costs are relatively cheaper than in Europe or the US. However, China’s recent crackdown on bitcoin miners might not only cause bitcoin’s value to plummet but might even threaten its existence -- without miners to validate bitcoin transactions, the cryptocurrency’s chances of survival are practically nonexistent. Bitcoin’s phenomenal performance in 2017 has undoubtedly rubbed its sheen on other leading crypto coins. As people embraced bitcoin and ether, the second largest cryptocurrency, other cryptocurrencies also attracted eager investors looking to cash in on the crypto opportunity. That has in turn given rise to ICOs (Initial Coin Offerings) that have quickly become the go-to fundraising alternative for entrepreneurs who are struggling to get funded or simply want the added benefit of an instant army of supporters. 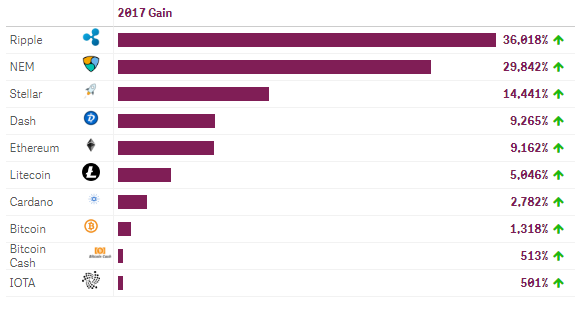 In fact, bitcoin doesn’t even make the top 10 best-performing crypto assets list for 2017 (see the chart below). Ether, the native cryptocurrency of the Ethereum blockchain, which supports smart contracts, has grown substantially in 2017 and is now the second-largest cryptocurrency on the market. One of the crucial factors that have significantly influenced ether’s surge in value is the rise of ICOs. What exactly is an ICO? Initial Coin Offering (ICO) is a recently emerged concept of crowdsourcing or crowdfunding where a company issues its own cryptocurrency to raise funds. If an ICO is successful, the company gets immediate capital to start (or continue) developing their product, and the community of investors get their crypto-tokens’ shares. CoinDesk’s Q2 2017 State of Blockchain report has found that blockchain ICO now outweighs venture capital by three times in total deal size and quantity. 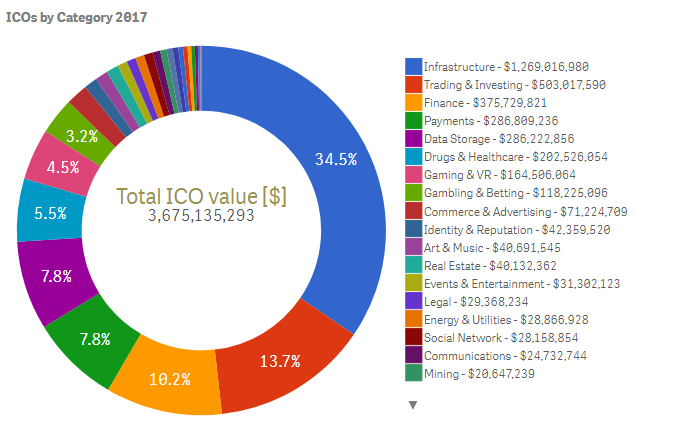 More than $3.7 billion has been raised through ICOs in 2017. The year has marked some of the largest token sales in history: Filecoin ($257 million), Tezos ($232+ million), Bancor ($153 million). These industries have managed to grab a piece of the growing ICO market. Start making sense of your data.